This is the story of how Lord Krishna effortlessly lifted the Govardhana hill to protect the Gopas and Gopis for seven days from the heavy rains summoned by Indra. From this story we will also learn how Lord Krishna got his name ‘Govinda’ and ‘Giridhari’ and both the names have a common story behind them. 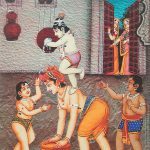 Little Krishna was seven years old and he was living in Vrindavan with his parents, Nanda Baba, Yashoda Ma and his elder brother Balarama. One morning, when Krishna woke up, he saw Nanda Baba and Yashoda Ma making arrangements busily. Krishna stepped outside the house and saw that the whole village was wearing a festive look. 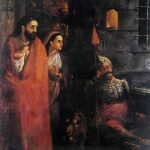 He wondered what the special puja was. He went straight to Nanda Baba and asked him about it. Nanda Baba replied that it was puja to Lord Indra because it was he who showers rains. Hearing this, Krishna told Nanda Baba and everyone there that it was Indra’s duty to shower the rains and it is not correct to please someone for doing their duty. He also told the villagers that it is their duty to do farming and rearing of cows and since they are doing their duty correctly, they should not fear or please anybody. He told the villagers that if they wanted to do Puja, they should do it to Govardhana hill where the cows have been grazing all these years and that Govardhana has been protecting them from various enemies. The villagers felt whatever Krishna said was correct and so they promptly performed Puja to Govardhana hill. In the meantime Indra was waiting for his share of food from Vrindavan. When it did not come, he sent his soldiers to check what was happening. They came back and informed that the villagers had performed Govardhana Puja instead of Indra Puja on Krishna’s advice. When Indra heard this, he took it as a personal insult. He became very angry at Krishna and wanted to teach him a lesson. He sent heavy rains and flooded the village of Gokula. When the heavy rains started, the Gopas and Gopis ran to Krishna and surrendered to him. Krishna led everyone to the Govardhana hill and with one hand lifted the hill and balanced it on his little finger. All the villagers and animals took shelter under the hill. The Gopas and Gopis felt bad that Krishna had to undergo all the trouble for them. In order to make them happy, Krishna played the flute with his other hand and danced. On seeing Krishna dancing and playing with the flute, Gopas and Gopis became happy. The rains poured for seven days and Indra ran out of stock of rains and they finally stopped. Everyone returned to their homes. 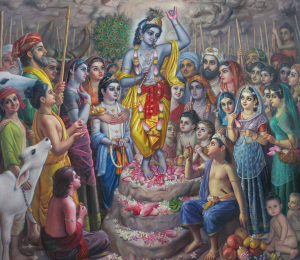 After ensuring that everyone under the hill had left, Krishna put Govardhana back in the same spot. Indra realized the power of Krishna, and realized his mistake for ordering heavy rains to destroy the people whom he was supposed to protect. On realizing his mistake, Indra ran to Krishna and fell at his feet and begged for forgiveness. Krishna forgave Indra since he realized his mistake. Indra did a coronation ceremony to Lord Krishna. 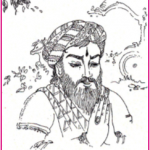 All Gods, Goddess, Gandharvas, Lord Brahma and Lord Shiva all witnessed the event. 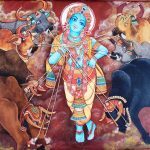 Kamadhenu, the holy cow showered Krishna with milk and Indra crowned Krishna with the title ‘Govinda’- the protector of cows. 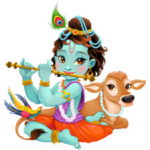 2 Responses to "Govardhan Lila"
Nice narration Meera! Keep it up. Mira dear! So wonderfully narrated. ‘Indra ran out of stock of rains’!!!! oh! my, my! I laughed and laughed on reading this. How well said! Keep it up. Hope to see more of your writings child!